The sound of ‘Celtarabia unplugged’ is unique with Quentin Budworth on Hurdy-Gurdy and Amanda Lowe on Hammered Dulcimer they play with passion, rhythm and wit. A wall of sound a blurring of notes an intricate pattern of melody harmony syncopation, consummate showmanship, great banter and a love of the groove make them really exciting performers to watch and hear live. The duo have been playing music together for over 20 years and have toured the world playing for audiences in Japan, Eastern Europe and Europe. Playing a mixture of self-penned and traditional tunes from around the world and presenting their music in a humorous and irreverent way ‘Celtarabia unplugged’ entertain audiences of all kinds. From street corners to concert halls Amanda Lowe and Quentin Budworth have played for audiences across the globe. Warning the combination of Hurdy- Gurdy and Hammered Dulcimer is unique, highly evocative, strangely hypnotic, highly compelling and completely unforgettable. 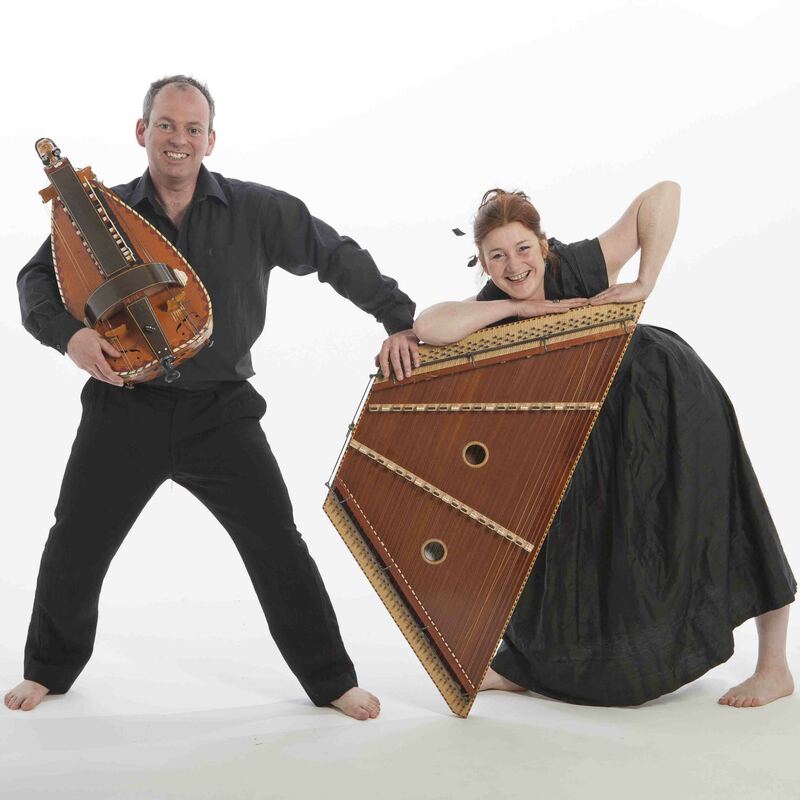 Celtarabia Unplugged – The magical combination of hurdy gurdy and hammered dulcimer brought together by two inspired musicians Quentin & Amanda creates a spell-binding aural feast that provides the missing link between medieval and contemporary cutting edge dance music. Great audience rapport coupled with fine musicianship and music that has wide genre-crossing appeal gives this duo an appeal that will ensure they go from strength to strength as they build on the firm foundations they established many years back with the excellent full band Celtarabia. Celtarabia have played at Dogs in Space in both their ‘sound system’ and ‘unplugged’ formats a number of times over the years and have gone down a storm every time! Unplugged, they breathe fresh air into traditional and ancient folk tunes, combining skilled musicianship on instruments rarely heard with strong vocals and a brilliant sense of humour, to produce a set that has the audience dancing right from the word go. These skilled exponents of ancient instruments and music are genuinely a pleasure to work with and to behold.